The blistering heat experienced by the nation during August, as well as the June through August months, marks the second warmest summer on record according to scientists at NOAA’s National Climatic Data Center (NCDC) in Asheville, N.C. The persistent heat, combined with below-average precipitation across the southern U.S. during August and the three summer months, continued a record-breaking drought across the region. The average U.S. temperature in August was 75.7 degrees F, which is 3.0 degrees above the long-term (1901-2000) average, while the summertime temperature was 74.5 degrees F, which is 2.4 degrees above average. The warmest August on record for the contiguous United States was 75.8 degrees F in 1983, while its warmest summer on record at 74.6 degrees F occurred in 1936. Precipitation across the nation during August averaged 2.31 inches, 0.29 inches below the long-term average. The nationwide summer precipitation was 1.0 inch below average. This monthly analysis, based on records dating back to 1895, is part of the suite of climate services NOAA provides. Excessive heat in six states – Arizona, Colorado, New Mexico, Texas, Oklahoma, and Louisiana – resulted in their warmest August on record. This year ranked in the top ten warmest August for five other states: Florida (3rd), Georgia (4th), Utah (5th), Wyoming (8th), and South Carolina (9th).The Southwest and South also had their warmest August on record. Only nine of the lower 48 states experienced August temperatures near average, and no state had August average temperatures below average. Wetter-than-normal conditions were widespread across the Northeastern United States, which had its second wettest August, as well as parts of the Northern Plains and California. Drier-than-normal conditions reigned across the interior West, the Midwest, and the South. Hurricane Irene made landfall near Cape Lookout, N.C. as a Category 1 storm on August 27, marking the first hurricane landfall in the U.S. since Hurricane Ike in September 2008. Irene made a second landfall in New Jersey as a hurricane on August 28, marking only the second recorded hurricane landfall in that state. Irene contributed to New Jersey, New York, Vermont, and New Hampshire having their wettest August on record. Meanwhile, Massachusetts (2nd), Connecticut (2nd), Delaware (3rd), Maine (3rd), Maryland (5th), Pennsylvania (5th), and Rhode Island (9th) had a top 10 wet August. Several major U.S. cities broke all-time monthly rainfall amounts during August. New York City (Central Park) measured 18.95 inches of rain, exceeding the previous record of 16.85 inches in 1882. In Philadelphia, 19.31 inches of rain was observed, besting the previous monthly record of 13.07 inches in September 1999. Louisiana (3rd), Tennessee (4th), Texas (5th), Mississippi (6th), Georgia, (6th), Illinois (8th), Washington (9th), and Alabama (9th) had precipitation totals among their top ten driest on record. Despite record rainfall in parts of the country, drought covered about one-third of the contiguous United States, according to the U.S. Drought Monitor. The Palmer Hydrologic Drought Index indicated that parts of Louisiana, New Mexico, Oklahoma and Texas are experiencing drought of greater intensity, but not yet duration, than those of the 1930s and 1950s. Drought intensity refers to the rate at which surface and ground water is lost, due to a combination of several factors, including evaporation and lack of precipitation. An analysis of Texas statewide tree-ring records dating back to 1550 indicates that the summer 2011 drought in Texas is matched by only one summer (1789), indicating that the summer 2011 drought appears to be unusual even in the context of the multi-century tree-ring record. Texas, Oklahoma, New Mexico, and Louisiana had their warmest (June-August) summers on record. Average summer temperatures in Texas and Oklahoma, at 86.8 degrees F and 86.5 degrees F, respectively, exceeded the previous seasonal statewide average temperature record for any state during any season. The previous warmest summer statewide average temperature was in Oklahoma, during 1934 at 85.2 degrees F.
Fifteen states had a summer average temperature ranking among their top ten warmest. West of the Rockies, a persistent trough brought below-average temperatures to the Pacific Northwest, where Washington and Oregon were the only states across the lower 48 to have below-average summer temperatures. Texas had its driest summer on record, with a statewide average of 2.44 inches of rain. This is 5.29 inches below the long-term average, and 1.04 inches less than the previous driest summer in 1956. New Mexico had its second driest summer and Oklahoma its third driest summer. New Jersey and California had their wettest summers on record with 22.50 inches and 1.93 inches, respectively. The U.S. 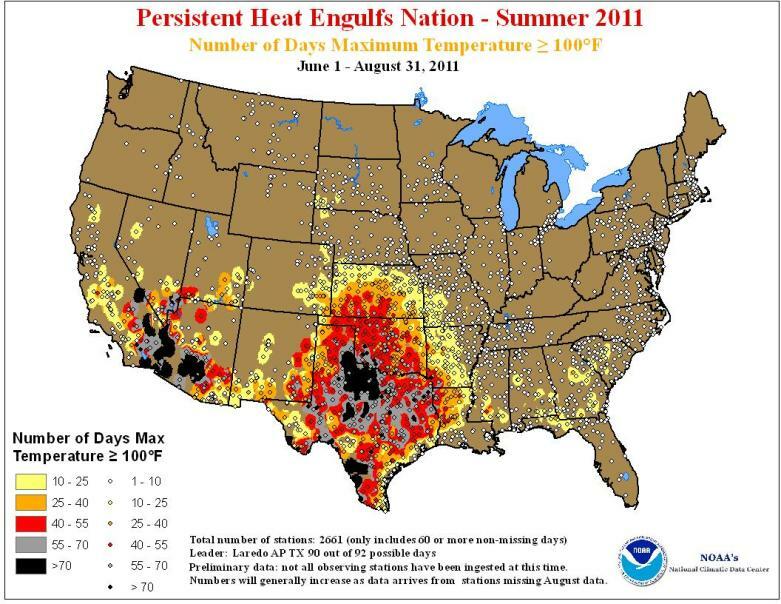 Climate Extremes Index, a measure of the percent area of the country experiencing extreme climate conditions, was nearly four times the average value was during summer 2011. This is the third largest summer value of the record, which dates to 1910. The major drivers were extremes in warm minimum and maximum temperatures and in the wet and dry tails of the Palmer Drought Severity Index. Based on NOAA's Residential Energy Demand Temperature Index, the contiguous U.S. temperature-related energy demand was 22.3 percent above average during summer. This is the largest such value during the index’s period of record, which dates to 1895. During the six-month period (March-August), much-above-average temperatures dominated the southern and eastern United States. New Mexico, Oklahoma, Texas, Louisiana, South Carolina, and Florida, all experienced their warmest March-August on record. Cooler-than-average temperatures dominated the West and Northwest. For the year-to-date period, the average statewide temperature for Texas was 69.9 degrees F, the warmest such period on record for the state. This bests the previous record for the year-to-date period of 69.8 degrees F in 2000. For precipitation year-to-date, New Mexico, Texas, and Louisiana have all had their driest January-August periods on record, while Ohio, Pennsylvania, New York, New Jersey, and Connecticut were record wet during the same period.